These Animal Kingdom sets include individually-labeled and jarred specimens representing the superphylum Ecdysozoa, which is comprised of both Nematodes and Arthropods, as well general representative specimens of Arthropods, Cnidarians, Echinoderms, Chordates and others. The Ecdysozoans 1 Animal Kingdom Set contains the following 12 specimens: Hermit Crab, Sowbug, Rock Barnacle, Fairy Shrimp, Carpenter Ant, Sphinx Moth, Giant Water Bug, Walking Stick, Southern Millipede, Tarantula, Peripatus, and June Beetle. 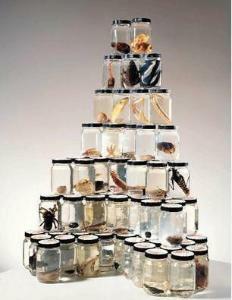 The General Specimens 1 Animal Kingdom Set contains the following 12 specimens: German Yellow Jacket, American Cockroach, Arrow Worm, Earthworm, Common Chiton, Mouse, Phoronidea, Ammocoetes, Starfish, Sea Anemone, Hydra, and Spongilla. 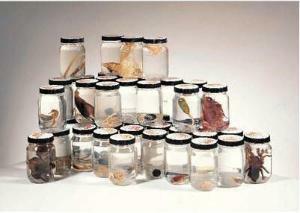 The Ecdysozoans and General Specimens 1 Animal Kingdom Set combines all 24 specimens listed in both sets above, providing cost-savings and allowing students to investigate the differences between specimens within the animal kingdom. Ordering information: Please note that exact species may very depending availability and regulatory changes. Please see our substitution list for the most common substitutions.